Don’t be mistaken by Noble House Seafood Restaurant as a restaurant that is related to the Oriental Group of Restaurants chain where they too have a restaurant named Noble House located along Jalan Delima. 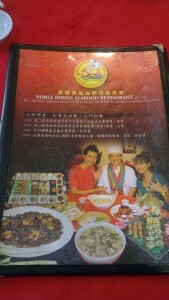 The Noble House Seafood Restaurant establishment grandeur is not as impressive and is in fact much more disappointing that the earlier mentioned Noble House. But what it lacks of, it gains back in the food served. You are currently browsing the Yummy Corner weblog archives for September, 2012.